CARFAX One-Owner. 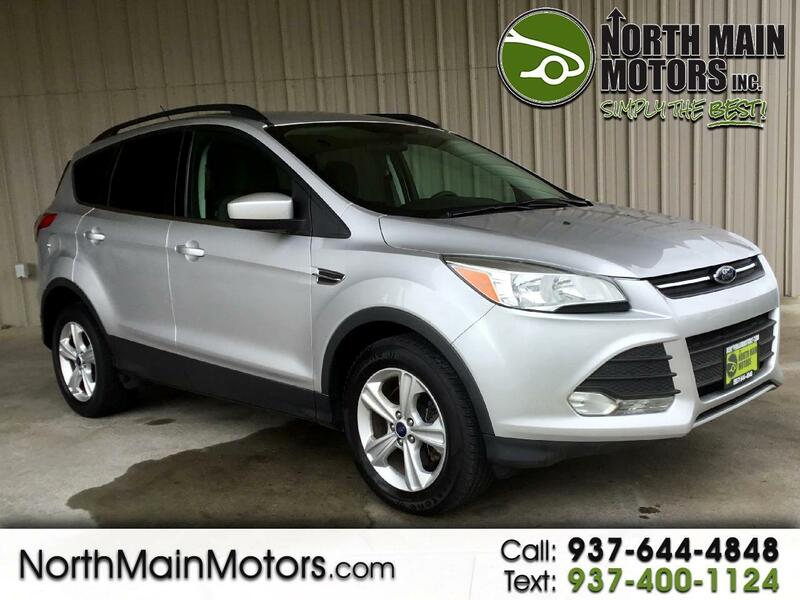 North Main Motors is delighted to offer this handsome 2014 Ford Escape SE In Ingot Silver. This vehicle is beautifully equipped with 3.51 Axle Ratio, 4-Wheel Disc Brakes, 6 Speakers, ABS brakes, Air Conditioning, AM/FM radio: SiriusXM, Brake assist, Bumpers: body-color, CD player, Cloth Buckets w/60/40 Split Rear Seat, Compass, Delay-off headlights, Driver door bin, Driver vanity mirror, Dual front impact airbags, Dual front side impact airbags, Electronic Stability Control, Exterior Parking Camera Rear, Four wheel independent suspension, Front anti-roll bar, Front Bucket Seats, Front Center Armrest, Front fog lights, Front reading lights, Fully automatic headlights, Illuminated entry, Knee airbag, Low tire pressure warning, Occupant sensing airbag, Outside temperature display, Overhead airbag, Overhead console, Panic alarm, Passenger door bin, Passenger vanity mirror, Power door mirrors, Power driver seat, Power steering, Power windows, Radio data system, Radio: AM/FM Single CD/MP3, Rear anti-roll bar, Rear seat center armrest, Rear window defroster, Rear window wiper, Remote keyless entry, Speed control, Speed-sensing steering, Split folding rear seat, Spoiler, Steering wheel mounted audio controls, SYNC Communications & Entertainment System, Tachometer, Telescoping steering wheel, Tilt steering wheel, Traction control, Trip computer, Variably intermittent wipers, and Wheels: 17" Alloy Sparkle Silver Painted Aluminum! Reviews: * Get-noticed styling, great fuel economy and a powerful technology package are three good reasons you might find the Ford Escape is just what you want in a small crossover. Source: KBB.com * Good performance and fuel efficiency; many high-tech features; agile handling; high-quality cabin; comfortable seating. Source: Edmunds * The second year into it's gorgeous new look, the 2014 Escape is a Compact SUV that is an absolute head turner. A major departure from its previous generation, this Escape is refreshingly modern with sporty attitude. Further, the interior of the escape showcases impressive design, and high quality materials. It is one of the leaders in its segment for gas mileage, styling, and great technology as well. There are three trims available for the 2014 Escape: S, SE, and Titanium. Standard on all 3 models, is a generous assortment of standard features. You get a 6-Speed SelectShift Automatic, Power Windows and Door Locks, a Storage Bin under the floor, Touch Controls on the Steering Wheel, and Flat Fold Rear Seats. Plus, it comes with a 6 Speaker, AM FM Radio with CD, MP3 and Auxiliary Input, and a Communication and Entertainment System. The Base S Trim comes with a 2.5-Liter, 4-Cylinder Engine with 168 Horsepower that gets an EPA estimated 22 MPG in the City and 31 MPG on the Highway. Plus the base also comes standard with the MyKey system for parents of younger drivers. The SE and Titanium come standard with a 1.6-Liter EcoBoost engine, with an optional 2.0-Liter EcoBoost I-4 engine available instead. Bought as a two-wheel drive, the 1.6-Liter gets an EPA Estimated 23 MPG City and 33 MPG Highway, while the 2.0-Liter gets 22 MPG City and 30 MPG Highway. The S Trim can only be purchased as a two-wheel drive but the other two models give you the option of four-wheel drive as well. In terms of Safety, all models are standard equipped with Front and Rear Anti-Lock Brakes, AdvanceTrac with Roll Stability Control, and a Rear View Camera Come experience the 2014 Ford Escape for yourself today! Source: The Manufacturer Summary From the moment you step on our lot until the time you drive away in your next car, your buying experience with North Main Motors is our number one priority. We encourage you to use the expertise and resources of our sales staff - they are here to help you find the right car at the right price. Call us today at 937-644-4848 to schedule your test drive! Message: Thought you might be interested in this 2014 Ford ESCAPE SE.